Help us make this Holiday Season special for children and families of the Caribbean! 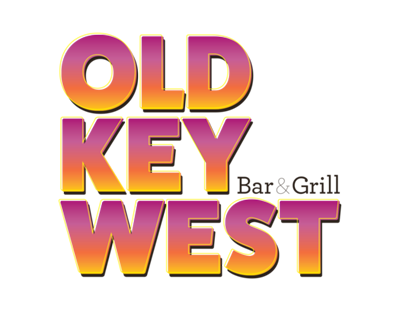 Bring new unwrapped toys to The Hangar Restaurant at Albert Whitted Airport, Atlas Aviation at Peter O’ Knight Airport, The Hideaway Cafe on Central Avenue, Salty’s Gulfport (5413 Shore Blvd S, Gulfport, FL 33707), Old Key West Bar & Grill (2451 Central Ave, St. Petersburg, FL 33713) between now and December 11th. It’s our goal to fill an entire 20′ container with toys for the Boys & Girls Club of USVI!! VOLUNTEERS ARE NEEDED! If you’d like to lend a hand on December 11th, volunteers with trucks or vans are needed to pick up toys at one of the five locations and deliver them to our freight forwarder in Tampa. Plan on 2-3 hours of the day. Please fill out the Contact Us form below to sign up. Thank you! SPECIAL THANKS to Bohlke International Airways for offering to fly the donated toys to U.S.V.I. Our initial efforts were focused on satisfying the immediate needs of the islands. Much of USVI and Puerto Rico continue to struggle without electricity and clean drinking water. Fortunately, commercial airlines are now providing service to the major airports in the islands so people are able to get to the mainland at reasonable rates. Additionally, large shipments of supplies are being delivered and dispersed to those in need within somewhat reasonable timeframes. Our mission has shifted from focusing mainly on disaster relief efforts to looking at how we can support the islands in rebuilding their communities. It’s estimated that over 15,000 homes have tarps to keep out the elements because of damage to their roofs, the majority of islanders will go at least 3-6 months without power and jobs are scarce. Many schools are still condemned and the hospitals are sub par. Water Purification Systems– many islanders do not have access to clean drinking water. We are researching and developing water purification solutions for individual homes and larger systems for the community. Coordination with FEMA and U.S. Military– FEMA and the U.S. Military have a large presence on the islands. Our team has created relationships with key members in both agencies to coordinate relief efforts by using their massive resources and our ability to get on the ground speaking to individual families and accessing the ongoing need. Support of Roof Replacements – the majority of the homes that lost all or part of their roofs now have tarps. We are investigating roofing solutions that are affordable but permanent for those families and educating families on their options between FEMA and other non profits that specialize in rebuilding. Solar Power – the majority of the islanders depend on power for their homes to be supplied with fresh water. In the USVI their water is filtered via electrical pumps. We are researching how solar power can be used in an affordable manner to get fresh water to more people in a timely manner and serve as permanent solution for the ongoing power outages. Medical Supply Deliveries – many medical centers are still in need of medical supplies. We have accumulated many donated medical supplies and are working to fund flights to deliver these supplies to the areas in need. 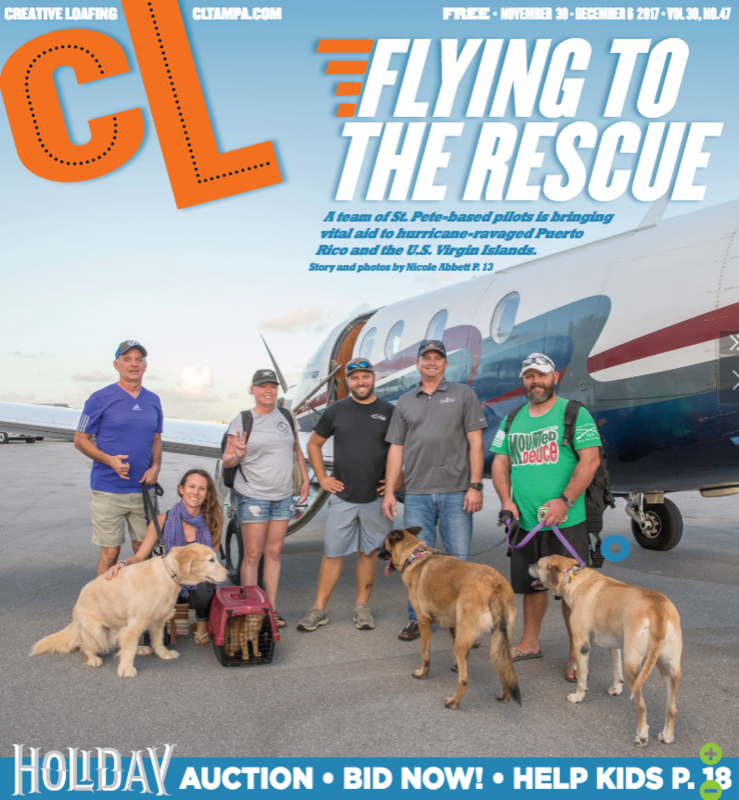 Animal Rescue – many islanders had to leave home without their pets due to airline and mercy cruise restrictions. We are working to fund flights that return these animals to their owners. 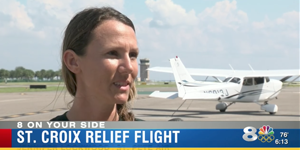 Local journalist and photographer, Nicole Abbett, joined us for relief flight #10 to Puerto Rico. Nicole tells our story in the November 30, 2017 edition of Creative Loafing. Learn about how our mission started, what we’ve accomplished and what we’re doing now by clicking the image above. My name is Jennifer Lockwood. 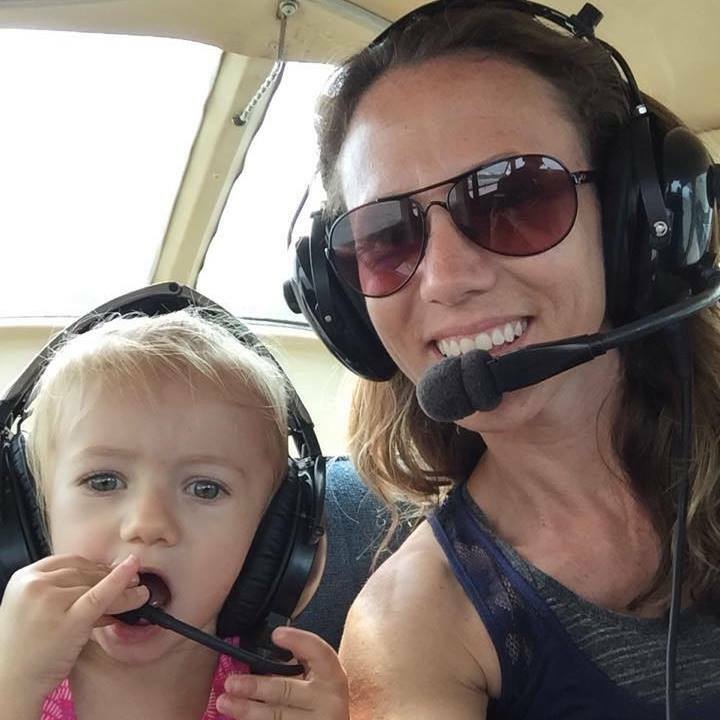 I work at St. Pete Air in St. Petersburg, FL – I’m a mother, a pilot and a former resident of the U.S. Virgin Islands. Once you’ve lived on the islands, you come to understand how close-knit this unique community is and that it’s not just the obvious beauty of the Caribbean, but the people who live there that truly make this region special. After moving to Florida from St. Croix three years ago, I have remained in touch with many friends who still live on the islands and I still do business and visit there frequently. My relationships and ongoing contact with my islander friends have put me in the unique position of being aware of what is needed now in the aftermath of Hurricanes Irma & Maria – simply put, the people of the Caribbean need our help. The devastation in the islands is unprecedented. Many island residents are living in conditions that most of us cannot fathom and without things we often take for granted like clean water, electricity and a roof over their heads. 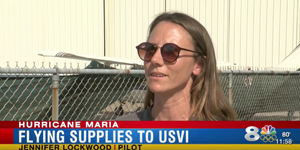 As part of my commitment to support USVI not only with immediate relief, but ongoing support, I have partnered with my employer, St. Pete Air, and a local nonprofit, the Glasscock Family Foundation, to provide support in ways that make sense economically and resourcefully. Working directly with my contacts in USVI we can provide exactly what’s needed where it’s needed in a timely and efficient manner. It is absolutely crucial that outside relief efforts not only continue, but sustain until the the U.S. Virgin Islands and Puerto Rico are stabilized and on a path to recovery. Our goal is to strategically empower the people of USVI & Puerto Rico with whatever they need to begin to rebuild while also providing relief effort supporters with feedback about how their donations are actually being used. How Bad Is The Damage to USVI? Posted to NBC News website on September 17, 1017 – this video shows the widespread devastation on both St. Thomas and St. John. 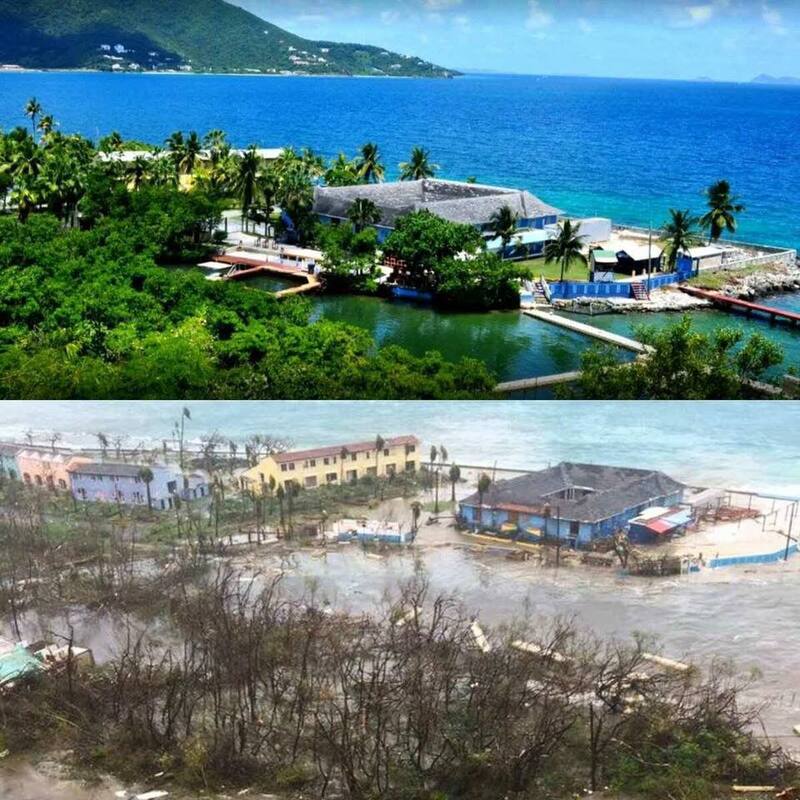 It is estimated that 80% of the structures on St. John have been severely damage. Keep in mind – this video is of damage that existed PRIOR to Hurricane Maria! We obviously do not have the same resources as the Federal Government or other large disaster relief organizations, which have been doing a tremendous job, but as a grassroots effort we can provide aid that adapts as needs change by staying in tune with specific requests from the islands. It took national aid organizations four days to arrive after Irma hit, while the resources coming out of St. Croix from local relief efforts came immediately. Personal fishing boats, charter boat companies and private planes have all been running non-stop to provide goods that have been gathered by the local community. The sustainable local farms on St. Croix have been sending fresh produce to the local soup kitchen that is serving over 600 hot meals a day to local St. Thomians. These efforts, and many more, are making an immediate impact. We know exactly where donations are going and will keep you updated with the progress of our efforts. With your help, our efforts can provide hot meals to families who have lost everything in the aftermath of the storms, give them power in their homes and begin to help rebuild the communities that make the Virgin Islands such an amazing place to live and visit. It’s anticipated that the majority of islanders will be living without electricity for at least 6 months. Unlike donations to national organizations that can take time to begin distributing funds and goods, your support will have an immediate and substantial impact on the Virgin Islands & Puerto Rico. We cannot thank you enough for your support and generosity. Many of the supplies we needed previously are now either available on the islands for purchase or are available because of your generous donations. We are currently hosting a Toy Drive in the Tampa and St. Pete area for the children of the USVI. Toys will be air freighted the week of December 11th. Help make our toy drive a success by dropping off new unwrapped toys at one of our local locations or donating funds. Thank you for supporting us in making a difference! A donation of any amount will help fund our mission. There is no amount that is too small. A donation of $350 dollars will purchase airfare for a skilled laborer to visit the islands. We have coordinated with island contractors to make sure that laborers are assigned to jobs that are crucial in rebuilding the island communities. A donation of $500 dollars will purchase chainsaws to help clear properties of down trees. A donation of $1,000 dollars will purchase a generator to allow a family or home to have power. Any amount you decide to donate will be very much appreciated and will make a huge difference in the lives of the Islanders whose lives have been upended. 100% of monetary donations will be used to support our mission. 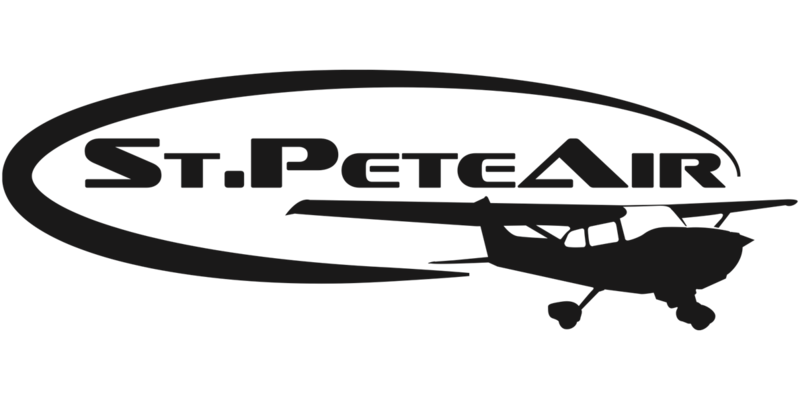 To see how your donations are making a difference, you can follow St. Pete Air and the Glasscock Family Foundation on Facebook. If you’re making a corporate or business donation and would like recognition on this page or on our social media, please use the form below to contact us. Together we can get the people of the Virgin Islands & Puerto Rico to a place where they can start to rebuild their lives.